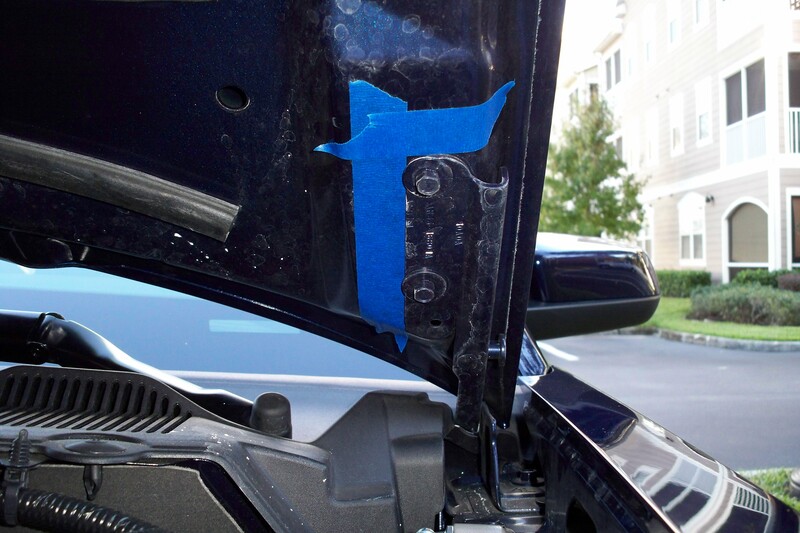 Are you ready to get rid of your hood prop? 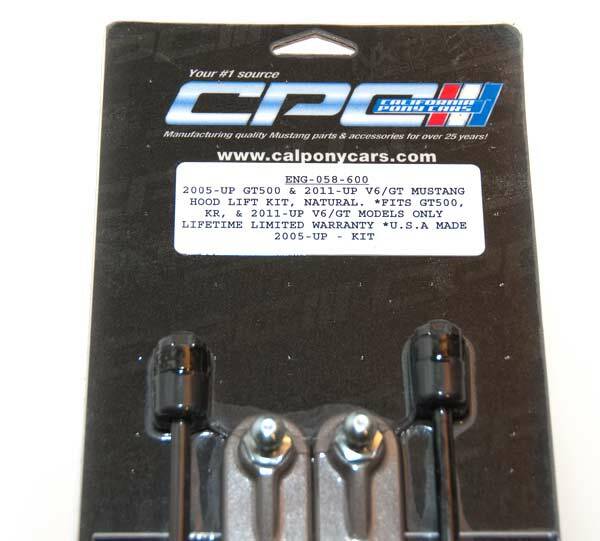 Then California Pony Cars (CPC) has a top quality Mustang Hood Lift Kit. 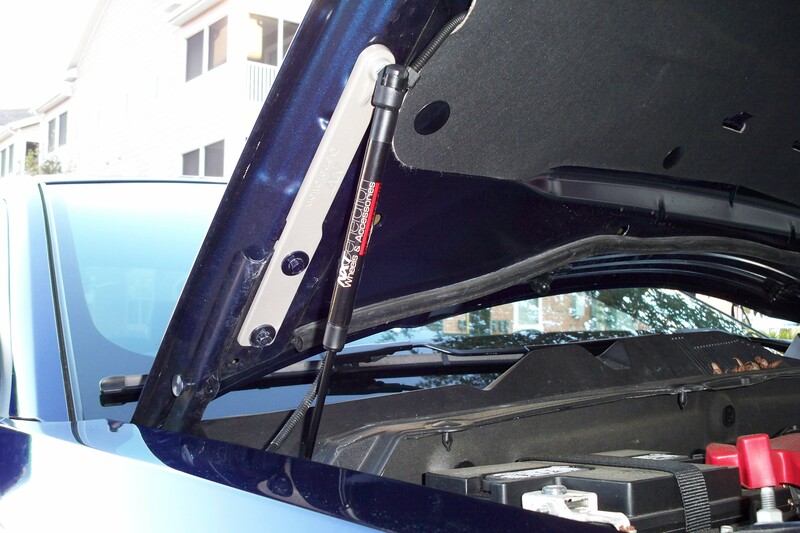 These Hood Struts are built right here in the USA and come in many colors. This particular kit was the Natural color, it retails for $104.95. This Kit is for the GT500 also. It is a different part number than the regular SN197 Kits. This a quick and easy install, anyone can do it using only simple hand tools. Begin by popping the hood and securing the hood prop. 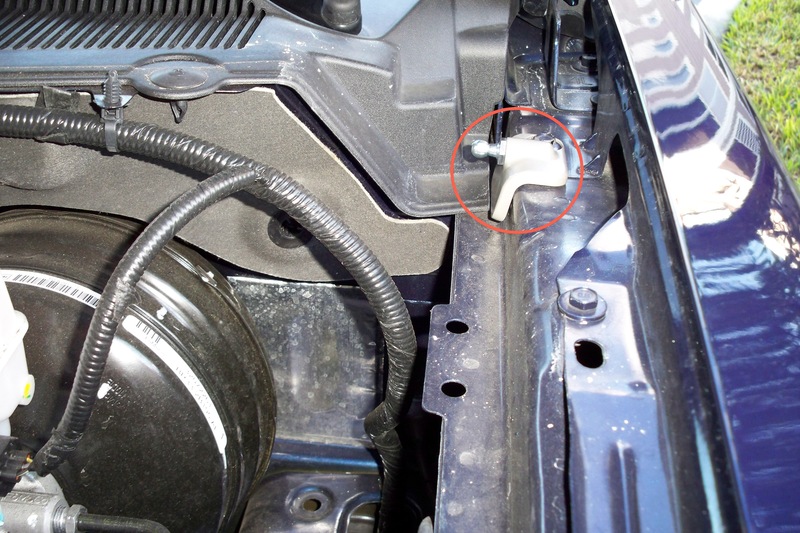 Once you have the hood prop in place, locate the windshield washer hose along the passenger’s side of the hood. 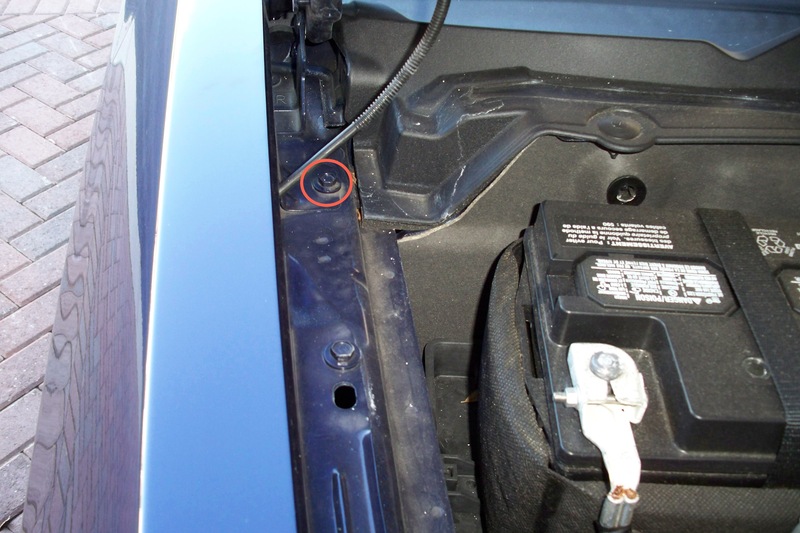 You will notice two clips (both circled in the picture to the left) attaching it to the hood. You will need to pull both of them out to have room for your bracket. After you pull the clips out, you will need to remove the 10mm fender bolt closest to the firewall. 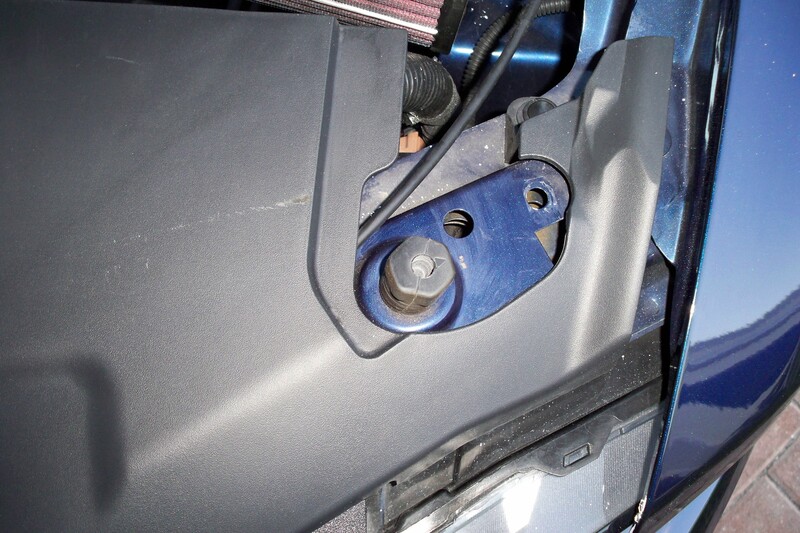 Now place the smaller bracket (labeled “PASS” for passenger’s side) on the fender and with the holes aligned insert the factory 10mm bolt back into the bracket and tighten it down. 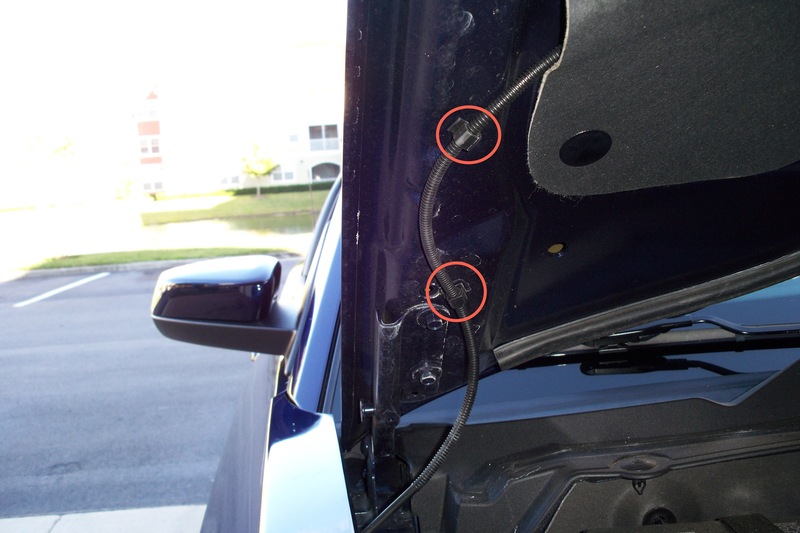 Repeat the same thing you did above to the driver’s side as well with second bracket labeled “DRVR” for driver’s side. To make it easy on yourself make sure to apply some masking or painter’s tape around the hinges as pictured here. 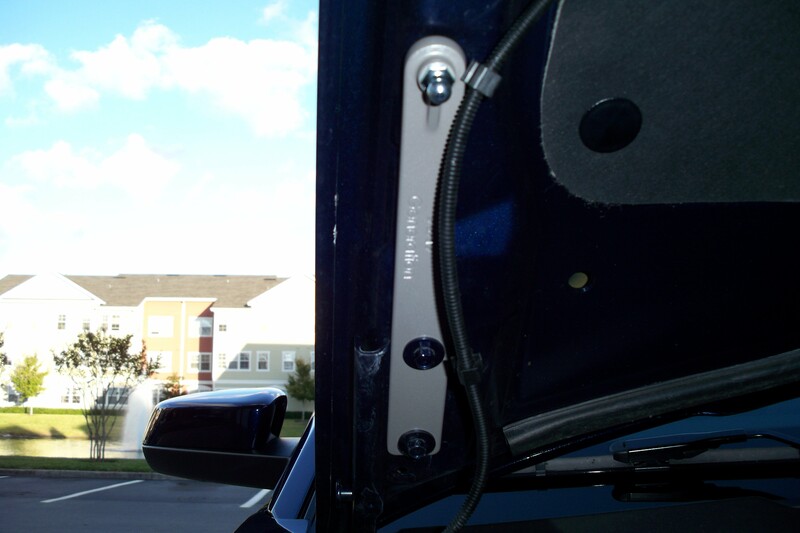 It will be easier to keep the hood aligned as you tighten up the hinge bolts. Once you tape around the hinge, remove the top 10mm bolt completely and then back the second 10mm bolt out enough to be able to slide the large bracket labeled “PSSNGR” into place. 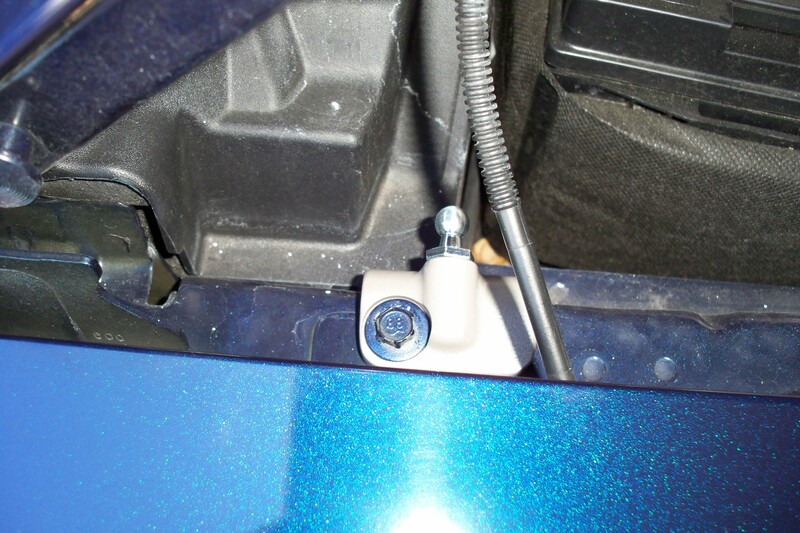 When you finish sliding the bracket into place, take the first bolt and hand tighten it down. 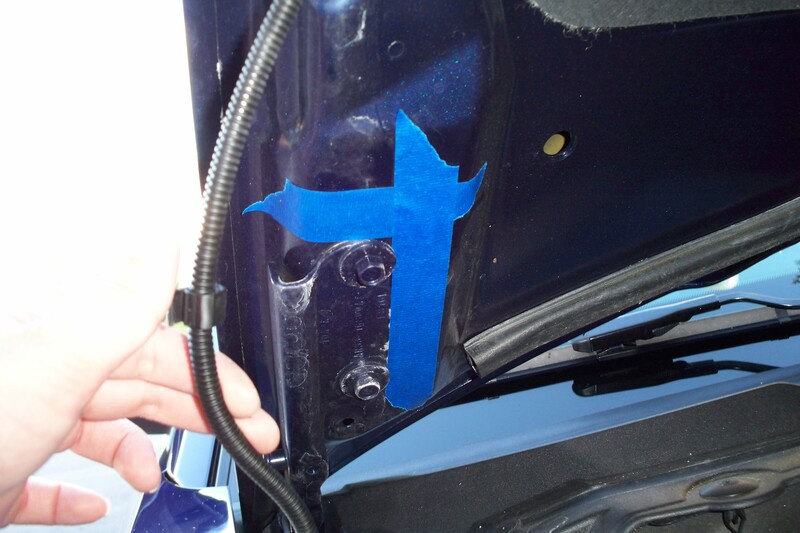 Adjust the hood to where the hinges meet with the tape and tighten the second bolt with a ratchet and then finish tightening down the first bolt. 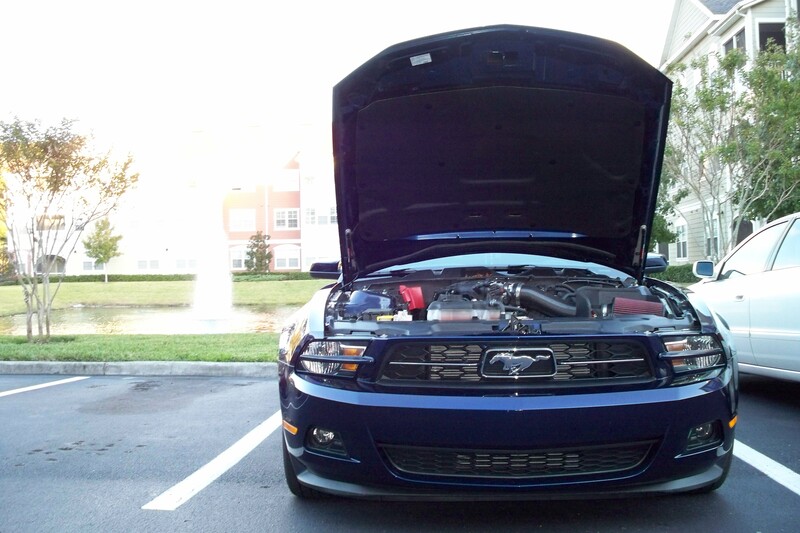 Once you have finished with the passenger’s side make sure you lay down the hood to check on the alignment. Adjust it now, if you need to. Now that you have checked the alignment, move onto the driver’s side and follow the same instructions as the passenger’s side. 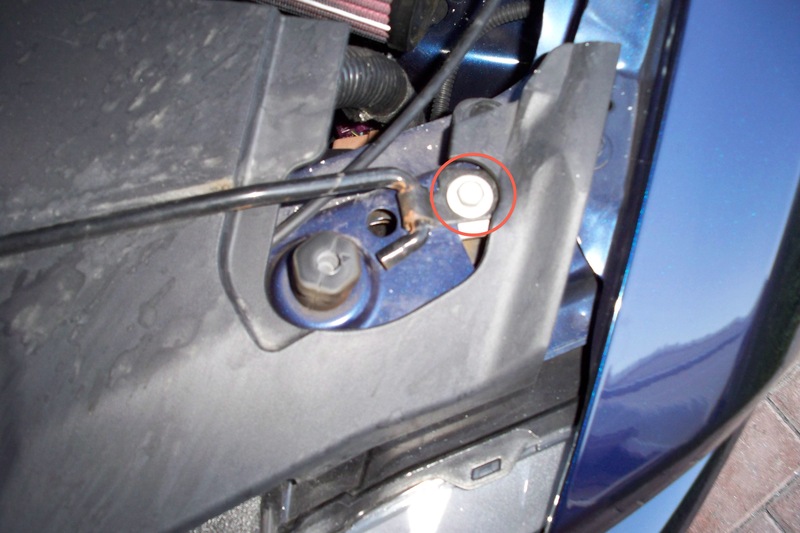 Lay the tape, remove bolt, loosen bolt, slide bracket labeled “DRVR” into place, adjust hood and tighten bolts. 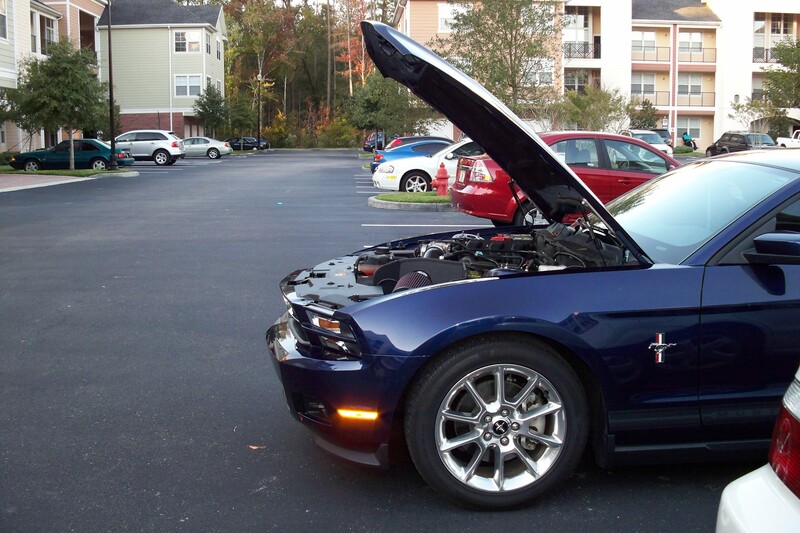 Remember to check the hood alignment to make sure everything looks good. Now that you have all the brackets in place and tightened down and the hood aligned, you can install the gas struts that will be holding your hood up. They suggest having a friend hold the hood up while you do this because you have to hold it up higher than the prop can reach, but the hood is light and the struts pop on easily, so I was able to do it on my own. If you decide to do it on your own be very careful! It doesn’t matter which side you begin on, but take both struts one for each side and with the cylinder part up and the shaft down pop them onto the ball studs on each bracket as pictured to the left. 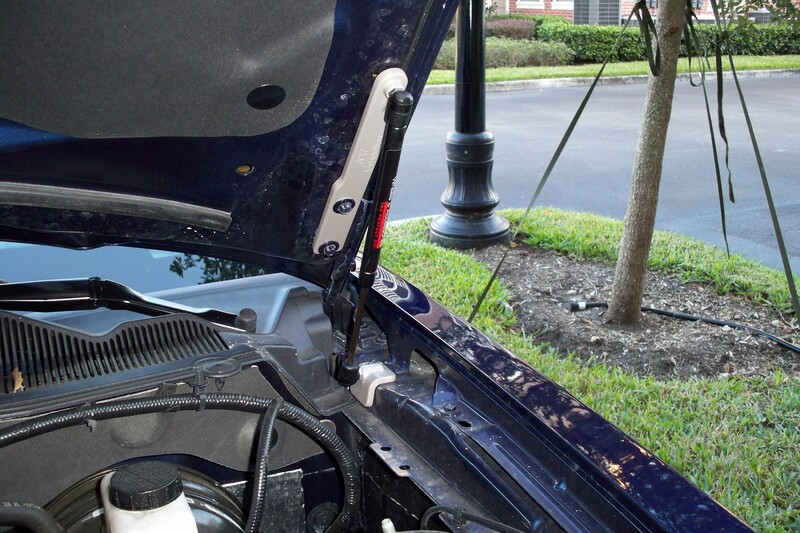 Make sure you install them correctly to insure the longest life out of the struts. Remember that you will need to hold the hood up higher to attach the other end of the struts. Now that you have the struts installed, you can remove the hood prop. This isn’t necessary, but since you won’t be using it, get rid of it! 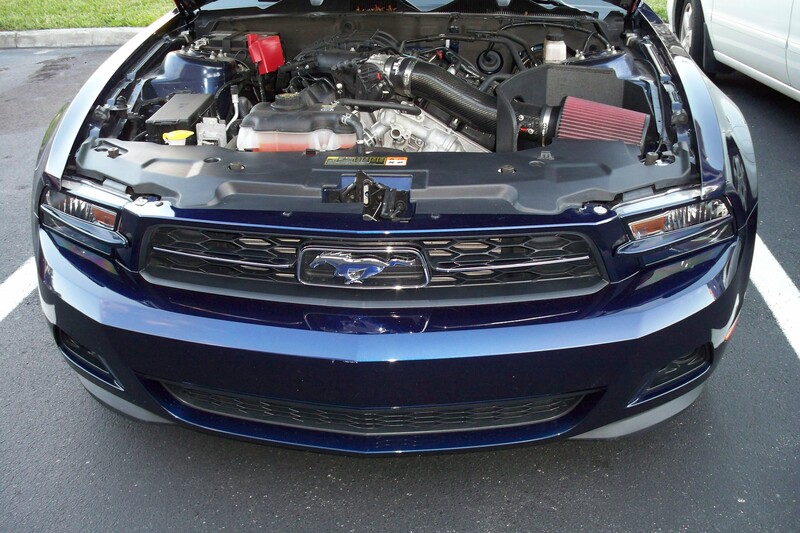 It’s easy and gives a much cleaner look under the hood. All you need to do is locate the 10mm bolt that attaches the end of the prop and remove it. The prop comes right off. Remove any other hardware that is left behind, and it should look like this. Much better! Here is a full view without the hood prop cluttering up the place. Side view of the hood struts installed. No prop in the way and it sits much higher, so there is so much more room to move around next time you need to work under the hood.